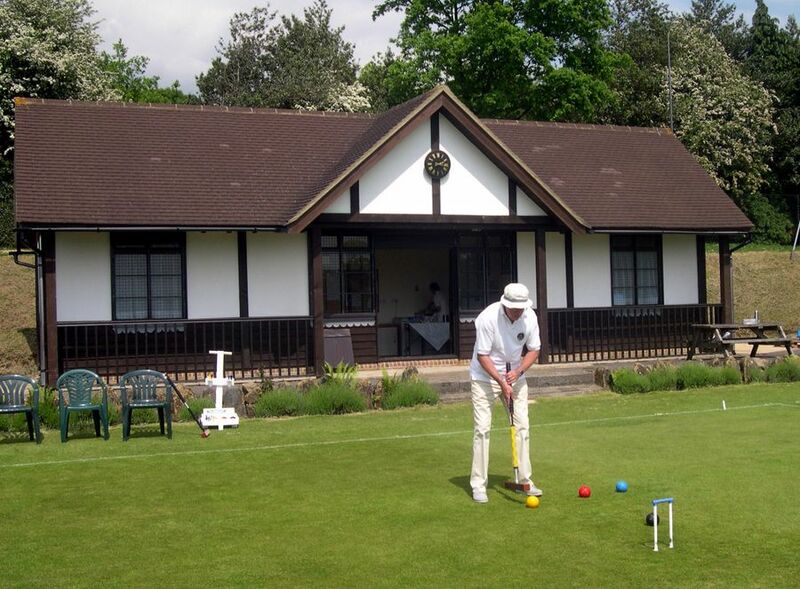 The Royal Tunbridge Wells Croquet Club is situated in Calverley Grounds, central Tunbridge Wells. It has three lawns and a smallish clubhouse. The club was founded in 1965 in a village about 10 miles from its current home and has moved a few times, before settling in its current location in 1995 in a public park. However, we aren't the first croquet club in Tunbridge Wells, with a combined tennis and croquet club formed in 1899 (which still exists as a tennis club) with croquet probably being played there till at least 1930. (Nerd note: the Tunbridge Wells Borough Council doesn't have Royal in its title, because Royal Tunbridge Wells, where the club now is, is technically only a part of the area the Council covers. The club has had Royal in the title since its beginning, but should only have been entitled to this after its last move. You need to get permission fron the Crown to use this title...). The closest postcode to the club is TN1 2LY, but this isn't necessarily quite as helpful as you might think, so click here for the location information on the Royal Tunbridge Wells Croquet Club website. Parking: There are several car parks close to the club which all charge. Full details of these are available on the club's website - the closest car park is in Crescent Road, 5 minutes walk away, and costs £6.30 per day (card payment only). From this car park cross the road at the entrance, go through the large stone arch almost opposite (just to the right), take the path to the right after 50 metres, before you get to the basketball court turn left and you'll see the Croquet Club about 50 metres straight ahead. We're hoping that some free parking may be available to players and officials - details will be made available here. The nearest train station is Tunbridge Wells which is about a 5 minutes walk away - four trains an hour from London and two from Hastings. From the station exit on Platform 2, cross the road, walk up the short road opposite (slightly to the left), through the entrance into the park (Calverley Grounds) and then on up the hill on the path to the left. At the top (at the end of the basketball court) turn right and you'll see the Croquet Club about 50 metres straight ahead. Rail travel from the Brighton/Shoreham areas takes about 2-2.5 hours, since the line through Tunbridge Wells is on a North-West/South-East alignment and so doesn't connect well with the South Coast trains through Brighton. There is a bus service (the 29) from the centre of Brighton which takes about 1.5 hours, passing through the town of Lewes. Given these public transport options we think it's likely that almost all participants who need to be here will travel by car. Phone: we don't have a landline at the club, but we're expecting to have a dedicated mobile phone during the Championship. Catering: The club will be providing salad lunches for competitiors and officials. It will also be providing tea, coffee and other soft drinks as well as biscuits and cakes for spectators. A cafe in our park (3 minutes away) provides sandwiches and limited hot and cold food. (The chips are alleged to be very good!) As we're in the centre of a town the compensation for a lack of parking facilities is that there is a full range of catering and shopping opportunities a mere 5 minutes walk away. So if you're not playing and don't want to spectate there's plenty to do - you can even be a tourist on foot!